A member of Greek Parliament, Dimitris Kammenos, from the far-right Independent Greeks party (ANELL) which is part of the current ruling coalition of the Greek government has equated staying in the European Union as an experience in Auschwitz for his country. 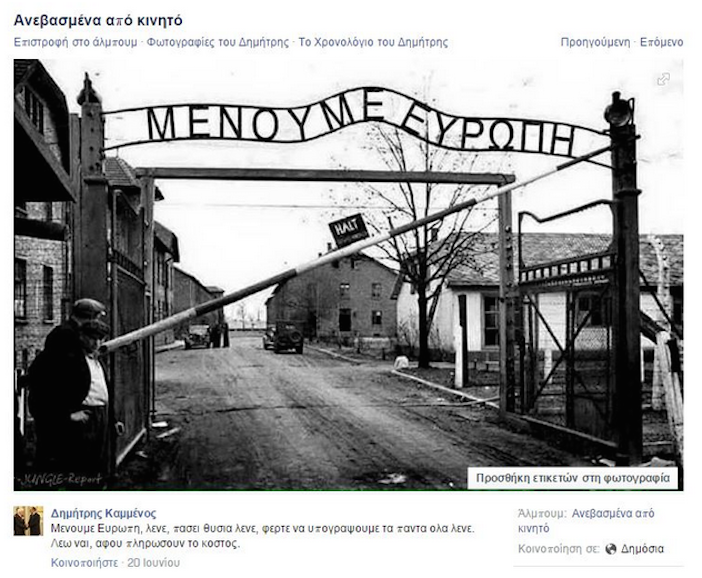 Kammenos posted a doctored photo of the front gate of Auschwitz which replaced the Nazi slogan «Arbeit macht frei» (Work will free you) with the Greek words MENOUME EVROPI, (We’re Staying in Europe), the slogan of the pro-Europe rallies that were recently staged in Athens. The same politician equated the euro currency to Auschwitz a month ago. Kammenos and other members of the Independent Greeks party have often been accused of being anti-semitic. 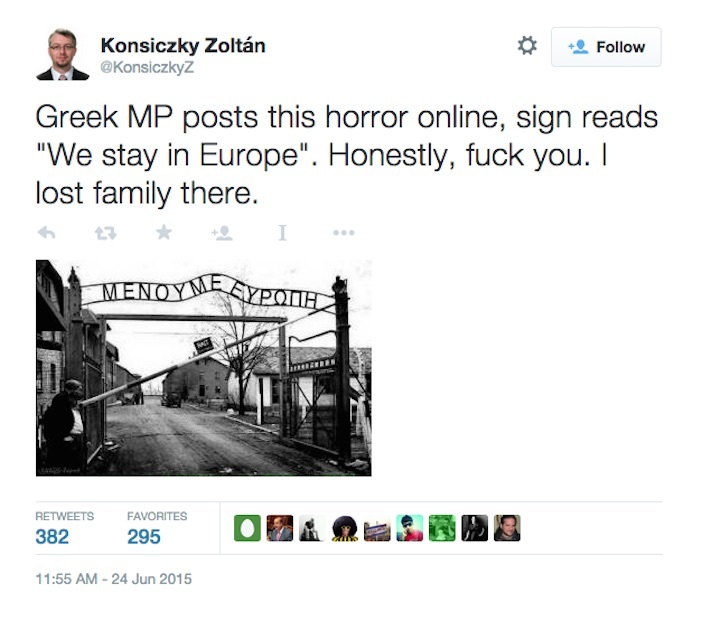 “The post trivializes in the most hideous way the sign over the gate of Auschwitz,” the Central Board of Jewish Communities in Greece said in a statement that was seconded online by a former deputy foreign minister, Dimitris Kourkoulas. The Central Board of Jewish Communities in Greece expresses the outrage and the repudiation of the Greek Jewry at the shameful photo posted on Facebook by MP Dimitris Kammenos (of the Independent Greeks – ANELL party). The post trivializes in the most hideous way the sign over the gate of Auschwitz. In the photo posted the “We stay in Europe” moto has replaced the world known sign which “welcomed” 1.500.000 Jews who were tortured and exterminated by the Nazis in the gas chambers. We call upon the President of the Greek Parliament and the representatives of all democratic parties to condemn the malevolent trivialization of the Holocaust of the 6 million Jews and all the victims of this barbarity, a trivialization that at the same time downplays the importance of the struggle against Fascism and Nazism in our country. We must not stay indifferent to such phenomena because if our society allows the distortion of the historical truth and memory of the Holocaust, it would have been as if we reopened the gate of Auschwitz to new crimes against humanity. Kammenos faced Twitter outrage as people from throughout the world criticized his post and protest on his own Twitter page. Last one out of the EU, please turn the lights off. 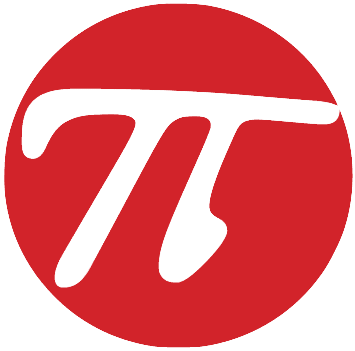 Skata mesto Angela Merkle’s stoma!